Prepaid credit cards have become more popular in recent years as people consider the dangers of debit cards and also the propensity for spending to get out of control when using credit cards. In fact, Bankrate says prepaid cards are now the fastest growing form of payment! According to a Pew report, general purpose reloadable prepaid credit cards had double the amount of money loaded onto the cards in 2012 than in 2009. Additionally, a 2014 Mercator Advisory Group survey found that 56% of Americans had bought some kind of prepaid card in the previous year, up from previous years. Prepaid debt cards definitely have some benefits that debit cards don’t have, and they have the convenience of a debit card without some of the risks. 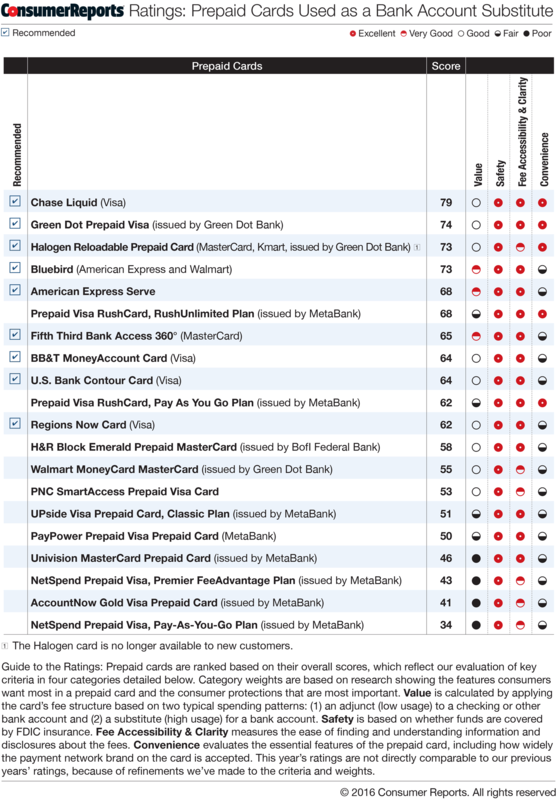 Consumer Reports tested several prepaid credit cards based on value, safety, accessibility and convenience and reported the results. When used in addition to a bank account, Consumer Reports found the Bluebird Card was the best on value, safety and accessibility and gave it a score of 79. But when used as a bank account substitute, Consumer Reports gave the Chase Liquid Card the best marks for safety, accessibility and convenience. Runner ups included the Green Dot Prepaid Visa Card and the Halogen Reloadable Prepaid Card. To see how Consumer Reports came up with these ratings and to see the full list, click here! Although prepaid credit cards are great for curbing spending, there are a few downsides. One is that depending on use, they may have higher fees that traditional bank accounts. Jeffrey Woolf, a Certified Financial Planner based in New York told Bankrate, ‘It’s a lot of grief for little buying power.’ He went on to explain that loading $100 on a prepaid card could cost you up to 20% in fees. However the top rated cards Consumer Reports tested had much lower fees. Another downside is that using a prepaid credit card does nothing for your credit score, since it’s basically just like using cash. Prepaid credit cards might be a great option for you if you really want to rein in your budget but you don’t want to use a debit card. Also, prepaid credit cards can be a great option for college students to keep the budget in check. If there’s no money on the card, they just decline! Prepaid debit cards become great teachers for not spending more money than you actually have. Should decline your bank’s overdraft protection?